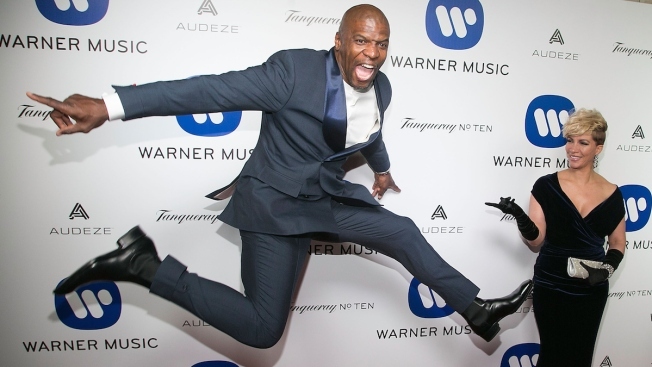 Terry Crews (L) and Rebecca King-Crews arrives for Warner Music Group's Celebration For The 58th Annual Grammy Awards at Milk Studios on February 15, 2016 in Los Angeles, California. Well, who knew it would be that easy? Terry Crews made a fan's day when he responded to a request via social media about using his image on a custom debit card. The fan, who goes by the Twitter handle @DarrelKennedy, wrote that she reached out to her bank about using the actor's image on a card but they wouldn't create it for her without the star's approval. So, she did what anyone does in the age of social media... she tweeted at Crews. But that may have been the easy part. Wells Fargo did not immediately respond to a request for comment on the matter. But if nothing else, the fan's gumption received applause from a handful of supporters across Twitter, with many joking Crew's disapproving look may make them think twice about making unnecessary purchases. This just needs to be an openly available thing. I'd save SO much knowing Terry disapproved of my spending. I would also want this card, but the ATM would likely explode with awesome every time I swiped it. If this could be approved for everyone, think about all the money that will be saved all over the world!